If you have a limited budget, you may definitely get more out of a well maintained used car – as long as it is in good condition and has low miles. Many used cars have warranties from the dealership or from the manufacturer. Always ask about a warranty before you make a purchase. Is the used car in good condition? Many used cars are in like-new condition, with perfect engines and low miles. However, if a used car is in poor condition, it may be more of a hassle to maintain than it’s worth. Does the used car meet my needs? While you may be in a situation where you need a new car fast, it doesn’t mean that you need to compromise your car-buying goals. Determine what you need from your new vehicle before you even begin to shop for a used car in Milton. For example, do you need a mini-van to haul around kids? How about a truck for contracting work? It’s important to buy a car that suits your needs, even if it means waiting. Can I make car payments? Whether you buy a new car or a used car in Guelph, you will still probably have car payments that you will need to make. Always analyze your budget to determine if you can truly afford to make those car payments on a regular basis for years to come. Do I plan to resell the car? If you plan to resell your car in the future, it may be a good idea to start with a new car, rather than a used car in Kichener. A new car may have a higher resell value, since you will be the primary owner. However, a late model used car could also be as valuable when it’s time to resell it. Buying a used car can be tough and daunting. Just remember: always do your research in advance in order to determine what cars are available on the market for your price range. It’s important to find a used car that meets your needs and falls within your budget – even if it requires some patience to find just the right car. Just about everyone that has ever tried to shop for a new used car in Kitchener knows that it can be tough to pick exactly the right used car from the lot. After all, car dealerships often seem to have many different models of used cars to choose from; it’s not like shopping for a new car where you know what model you want and just get to select the features. Make a list of all of the features that you want from your next used car in Milton. Do you want a gas-saving coupe? How about a travel-ready SUV? Does the car need to have special features, such as a sunroof, XM Satellite Radio, third row seating, or ample trunk space? How do you plan to use the car? If you plan on going off road or driving in the snow, should you look for a car with all-wheel drive? By assessing your basic needs, you will be able to quickly narrow down which choices do not meet those basic needs almost as soon as you step on the used car lot. From there, you will be able to make more detailed decisions, such as which special features you need to have in the car. Every car owner should have at least some working knowledge of cars that can help him or her operate the car effectively, such as how to check the oil. However, when it comes to purchasing a used car, it is always a good idea to either have the used car in Guelph looked at by a qualified mechanic, or to have a mechanic give you a few pointers for what to look for. For example, you probably know that if anything is hanging off of the undercarriage of the car, the car might need some maintenance. However, would you know how to look for a cracking timing belt, which might break soon down the road? How about signs that the oil has not been changed regularly, as is healthy for a car? Take some time to ask your mechanic for a few tips that can help to make or break a successful car purchase. When possible, always have the car looked at by a mechanic before purchase. A new car, even if it is used, is a substantial purchase. Therefore, be sure to be patient. Look around at several dealerships for the right car before settling on one. Read classified ads. Check for cars online. By being patient and looking around for what’s available, you’ll understand what types of cars are within your price range, how much mileage you should expect to get for your price range, and you will be a more savvy shopper when it comes to making that big purchase. Again, buying a new car is a big undertaking, but it’s one that you shouldn’t have to do on a regular basis if you take your time and make wise decisions up front. Be patient, do your research, and evaluate your needs prior to stepping onto the used car lot. Making a plan will help you get the most out of your budget and your needs. When buying a car, it is often necessary to take out a loan in order to buy the right car. A car loan in Guelph not only helps you to get a car that you will enjoy driving, but it also helps to ensure that you will have an affordable payment plan for that car. After all, without being able to take out a car loan, you’d have to buy the entire car with cash, which can be very financial straining for many people. Everyone qualifies for a car loan at our dealership – even those customers that have bad credit or no credit. We believe in the value of a car loan when it comes to being able to get the right kind of car. Therefore, we work hard to develop affordable loan arrangements that each of our customers can take advantage of. If you have bad credit or no credit, you may have to be a higher interest rate for that car loan than someone who has excellent credit. However, the best way to get excellent credit is to take out loans that you repay. Therefore, you’ll be benefitting in the long run by taking out the bad credit car loan and establishing a good credit record. Whenever you take out a car loan, you’ll have an interest rate attached to that car loan. Interest rates vary a great deal depending on the type of the car loan in Guelph, the duration of the car loan, the amount of the car loan, economic conditions, your credit history and financial position, and specials that we may be running that the dealership. For all these reasons, the interest rate that you get for a car loan may be very different than the interest rate that someone else gets for the same car loan. It’s important to us that you decide which car loan you get when you buy a car. We will offer you several different options for your car loan, but you make the final car. Our experience is that when our customers decide which car loans are best for them, they are more comfortable with the monthly repayments, so the burden is less. Contact Milburn Auto Sales, your used car dealer in Guelph today at www.milburnautosales.com for more information about car loans or to get started with a car loan program that’s just right for you. Are you looking for a great used car in Kitchener at a price you can afford? If so, then take a closer look at the wide variety of used cars and parts that we have available at our dealership. We work hard to make sure that each of our customers has the financial arrangement, options, and service that they need in order to buy a used car that they will love for years to come. When it comes to finding the right used car for your needs, there’s no mistaking the fact that it’s important to have access to a wide variety of options. 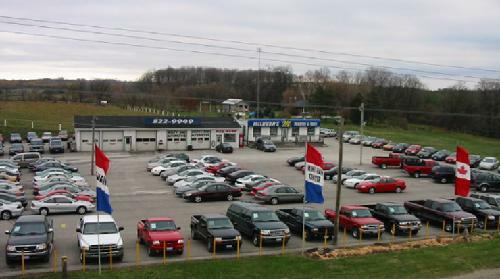 The used cars in our lot are diverse and represent the finest selection of used trucks, used vans, used SUVs, used sedans and more. Plus, if you find a used car in our lot that you absolutely love, you can customize that used car even more to meet your specific needs by selecting components for the used car from our accessories. These accessories may include items such as roof racks, larger wheels, running boards, and so much more. Many of our used car customers are financially savvy individuals who know that one of the most economical decisions they can make is to buy a used car. That’s why we work hard to make sure that these customers are completely happy with the financing options that we offer. These financing options may include low interest rate loans, trade-in opportunities, and even special programs that can reduce the purchase price of the car even more. Contact Milburn Auto Sales, your used car dealer in Guelph today to learn more about the financing programs that we currently have available for your needs. All of our used car customers will be able to take advantage of our comprehensive warranty program. This program is designed to help our customers save money and time in the event that they need their used cars to be serviced. The warranty program covers many major issues that may affect the used car. However, we want to reassure all of our used car customers that we thoroughly inspect every used car we sell before we put the cars on the lot in order to ensure that our customers will have access to the safest and most reliable cars available. Contact us today to get started finding the right used car in Milton for your needs or for more information about any of our used car programs!